Space is an amazing physics laboratory, because we can see stars and other objects behaving under extreme conditions. Space.com columnist and astrophysicist Paul Sutter explains how quark stars work in the latest episode of "Ask a Spaceman." In Episode 10 of the Facebook Watch series, Sutter says that the topic of quark stars is so complicated, he's going to take three episodes to explain them. This episode is Part 1. "There are some episodes of this series that are just going to be a one-way trip to jargon town, and this will be one of them," he warns. We don't even know if quark stars exist, but Sutter elucidates the principles behind them. If quark stars existed, they would be almost unimaginably dense — but how could such stars keep from collapsing even further? This episode goes into some detail about a phenomenon called "degeneracy pressure." Sutter briefly touched upon this concept in Episode 9, in which he talked about how normal stars burn through different elements as their cores undergo fusion. When a star that is roughly 20 to 25 times the mass of our sun fuses elements for long enough to reach iron, it converts into an ultradense, city-size neutron star. Degeneracy pressure is the force that stops a neutron star from collapsing even further. Here's how that pressure works: Particle physics assumes that two ions (or the building blocks of an atom — electrons, protons and neutrons) cannot occupy the same quantum state. In other words, two ions cannot have identical spin positions, energy levels or other distinguishing properties. Degeneracy pressure happens in exotic star types — such as white dwarfs and neutron stars — because even though all the electrons in these stars would like to occupy the same ground state, physics dictates that they cannot. So the individual electrons are forced into higher energy states. This energy is what stops the star from collapsing, Sutter says. The physics in these kinds of objects is super-weird. For instance, you can see a direct impact of the Heisenberg Uncertainty Principle, which says that we cannot measure both the position and velocity of small particles with the same degree of precision. 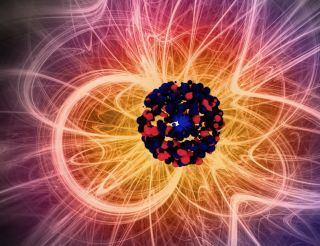 So in a neutron star or (theoretical) quark star, Sutter said, it's very easy to find the position of a particle; after all, the particle is crammed into a ball of other particles. Scientists assume the particle must be vibrating at high speed because it's trapped in place, but it's difficult to figure out how fast it's moving. That's where we'll leave our quark star for the moment — with its individual particles "buzzing like crazy," as Sutter puts it — but check out next week's episode to learn more about this weird object. The episodes will be released weekly on Wednesdays at 12 p.m. EDT (1600 GMT), so like the series Facebook page or check back later to see more. Sutter also responds to reader questions in every episode. Check the page to learn more about past topics the show covered, such as the Big Bang, Pluto and galaxy collisions. Sutter is a cosmologist at Ohio State University and chief scientist at the Center of Science and Industry in Columbus, Ohio. He has a long-running podcast, also called "Ask A Spaceman." You can catch all past episodes of that podcast here. Follow us on Twitter @Spacedotcom and on Facebook. Original article on Space.com.